I try to post here at least once a week if not more, and I had planned to post before Spring Break which began for me at noon on April 21st. However, life got in the way. I have not visited this blog for two weeks. Actually, except for the occasional email and a couple of shopping trips, I did not get on the computer during my break. It was really liberating. I made sure to do some reading though. 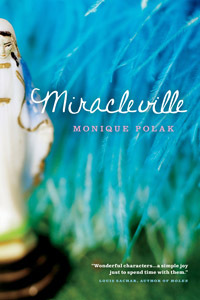 First on my list to read during break was Miracleville by Monique Polak, who I have mentioned in my blog before. Since we had such a fun email exchange, I thought that it was only fittng that I actually read one of her books. It was a quick read that focused on a family living in a small Quebec town that caters to tourists who travel there to find miracles for their ailments and handicaps. The family owns one of the souvenir shops in town. The story is told from the older daughter's point of view. The story begins during summer vacation so both girls are home and available to help out in the family business. The summer proves to be quite an eye opener as Ani learns something about her past that her mother had hidden from the family, her sister Collette gets a boyfriend, and their mother finds out that she is going to need a miracle. I was not expecting such a strong religious aspect to the book, so I would want potential readers to know that up front. The students in my library book group are very picky about what they will and will not read. I don't always understand how they make their selections of what is and what isn't a readable story for them. If I am recommending a book, I try to give them the details that I think will help them decide if a book is read-worthy for them. The other book that I read over break was the sixth in a series that I have been following for years. I am a big fan of Jasper Fforde and his Thursday Next series. One of our Thursdays is Missing did not disappoint. 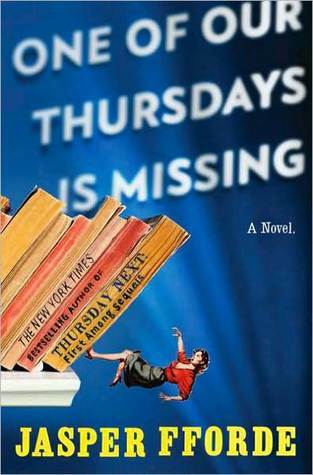 At first, I thought that I would dislike the book because the main character in this one is the written Thursday not the real Thursday. Almost all the action takes place in the Book World. I liked the written Thursday, and the puns were flowing as usual. I don't think that this book stands alone. You need to have read the previous titles to understand what is happening as he gives little back story to the characters. If you are a fantasy fan who likes humor and is willing to wade through the numerous play on words then this is a series for you.